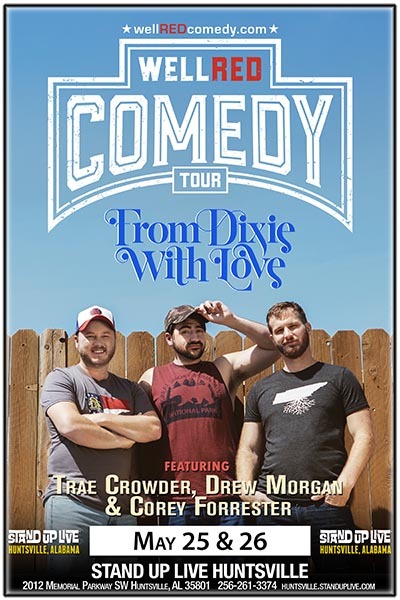 Trae Crowder (The Liberal Redneck), Drew Morgan and Corey Ryan Forrester are stand-up comedy and drinking partners hailing from East Tennessee and North Georgia. The trio have spent the last three years touring nationally to sold out clubs and theaters as the wellRED comedy tour. Their comedy is about celebrating everything great about the South and telling stories from a place of love. It’s about dancing to country music at a gay wedding. It’s about loving your neighbor whether you have the same religion, skin color, or sexual preference, as long as they cheer for the same college football team (Go Vols!). It's about leaving behind bigotry, but remembering the fried okra. Trae, Corey and Drew have been featured guests on The View (ABC), Real Time with Bill Maher (HBO), Nightline (ABC), Last Word with Lawrence O’Donnell (MSNBC), CNN Tonight with Don Lemon and various programs on MTV, MSNBC, CNN, BBC, Fusion, NPR and SiriusXM. They also co-host their own topical weekly podcast recorded on the road, wellRED podcast, which has reached over 3.5 Million downloads internationally.